been given supervision or instruction concerning use of the appliance by a person responsible for their safety. children or pets are nearby. machine unattended for any period. all times while operating the machine. wearing open sandals, always wear substantial footwear and long trousers. rotating tine/blade can cause injury. leave it outdoors when it is raining. can cause other tines to rotate. f Wear full eye protection when using the machine without the catcher. f Rake/Verticut only in daylight or in good artificial light. f Raking/Verticutting on banks can be dangerous. f Do not rake/verticut excessively steep slopes. – Rake/Verticut across the face of slopes – never up and down. f Never rake/verticut by pulling the machine towards you. machine to and from the area to be raked/verticut. f Never operate the machine without the catcher or deflector guard in position. f Switch on the motor according to the instructions with feet well away from rotating parts. hands are in the operating position before returning the machine to the ground. live parts. Beware electric shock hazard. sure that the machine is in safe working condition. f Check the catcher frequently for wear or deterioration. or working near the sharp tines/blade. instructions for the order no. and types. connection must not be in water. This product is intended for domestic, lawn raking, scarifying or verticutting of lawn. At higher height of cut level the product is intended for collection of leaves in the lawn area. When fully assembled the machine weighs approximately 9.9–10.4 kg. If necessary, obtain assistance to remove from packaging. away) and EN ISO 5349. Typically the A-weighted noise levels of the product are: Sound pressure level 78 dB(A); Guaranteed sound power level lower than 94 dB(A). Uncertainty K =3 dB. (from 29 Dec 2009), 2000/14/EC. 92 dB(A). Conformity assessment procedure according to Annex V.
f Always wear gardening gloves when handling or working near the sharp tines/blade. type design (60227 IEC 53, 60245 IEC 57). Fix the handle bottom 6 to the body of the machine with two bolts and wing nuts. wing nuts to the handle bottom 6.
used to fix the cable to the handle. must be of watertight construction and intended for outdoor use. check your RCD every time you use it. possible shock hazard and should never be inserted into a 13 A socket elsewhere. Fasten the two red clips (one per side). Attach/remove the grassbox 7 as shown. achieve the desired cutting height. Repeat this for both sides of the product. Allow the motor and tines/blades to stop rotating before switching “on” again. f Do not rapidly switch off and on. Press and hold the safety button 3. Release the safety button 3. Release the switch lever 2.
to do so could damage the machine. the supply will prolong the reset time of the safety cut out. The safety cut out will only reset if the switch lever 2 is released. cut out to reset before continuing to use the machine. occurs, stop using the machine. of cut or postpone use until conditions improve. Please refer to “trouble shooting table” and “raking/verticutting tips”. raking/verticutting position and lower as necessary. the whole lawn has been completed. bare patches depending on lawn conditions. For best results mow the lawn before reseeding. water to prevent fresh seeds drying out. Also lawn can be maintained by raking/verticutting on a higher setting after every six cuts. 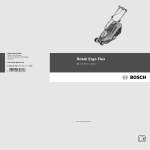 machine with a height of cut setting of either 3 or 4.
service agent for Bosch garden products. down and remove the tine 12 from the pin 11. The new tine 12 is mounted in reverse order. especially from the ventilation slots 8.
space, fold up the handle fully.